Celebrity crusader: Janata Party president Subramanian Swamy has appeared as petitioner-in-person for many cases, including the one challenging the Union government’s Sethusamudram ship canal project. New Delhi: No suspension of disbelief was required while lawyers and journalists watched Arvind Gupta argue his case in a packed courtroom in the Delhi high court last week. As he clutched a petition that he had drafted, Gupta took on India’s policy on the auctioning of mobile telecom spectrum, with no lawyer by his side. While most of these petitions have failed, these individuals, known as petitioners-in-person, are increasingly comfortable in taking on the government, arguing a wide range of issues, be it the Ram Sethu dredging project, reservations for other more backward classes in higher education or the telecom policy. Supreme Court lawyer Sanjay Parikh says while such petitioners were not uncommon in the past, the accelerating trend stems from a dearth of “genuine" lawyers who can take up such PILs. “Genuine, in the sense, those who take up cases with a spirit to contribute to society," says Parikh, adding that “high fees charged by lawyers is also another reason" for petitioners bypassing professionally trained lawyers. Some professional lawyers “show willingness to represent you, but keep dilly-dallying and also dissuade you from filing your petition and frustrate your efforts", says Gupta. “The genuine ones get involved in so many issues they don’t have time to take up all cases," he adds. Gupta filed his petition simply by paying Rs56 to the high court, soon after he read news reports on recent telecom deals, especially one that allowed real estate company Unitech Ltd to sell a big stake in a start-up telecom subsidiary to Norwegian telecom group Telenor ASA for Rs6,120 crore, essentially flipping a lucrative spectrum licence it had recently obtained from the government for Rs1,651 crore. “There must be no unfair and unjust enrichment of few corporate entities," says Gupta. “Spectrum should be auctioned in a fair and transparent process." The court admitted his PIL and the next hearing is scheduled for 10 December. Gupta is the founder trustee of the Indian Investors’ Protection Council, a registered non-profit organization that takes legal actions in the interests of Indian investors. Some petitioners, who are “intelligent, sensible and have a reasonable grasp of the law, choose to argue their own cases even though they can afford lawyers", says civil rights lawyer Prashant Bhushan, who has been handling numerous PILs in the Supreme Court on issues such as testing of genetically-modified crops. He recalls the efforts of H.D. Shourie, who argued his own cases while representing Common Cause, a non-profit group dedicated to solving collective problems of people. According to another petitioner-in-person, Ritu Ahuja, her “emotions" brought her to the portals of the Supreme Court. This 29-year-old housewife from Uttar Pradesh claims to be the first woman to file a case under the Domestic Violence Act, 2005, in the Bundelkhand district of Jhansi. While this case is still going on in Jhansi, in February, Ahuja filed a PIL before the apex court highlighting the inadequacies she found in the Act and the government’s laxity in implementing it. “The law says that the government should provide a counsellor and service providers to aid deserted housewives while filing their cases so that lawyers do not take undue advantage of them. This has not been done," Ahuja says. But in March, Ahuja, who argued as a petitioner-in-person, withdrew her case in the Supreme Court after she was unable to answer some legal questions put to her by the judge. Senior counsel Indira Jaisingh, who was in the court while Ahuja argued her case, volunteered to take up her case pro bono. Ahuja’s father D.K. Sood says he coaxed his daughter into arguing her own case as he has “no faith" in lawyers. “They fool educated and uneducated people. In Jhansi, there was no lawyer who could fight a public interest case. The Supreme Court lawyers asked for Rs1 lakh to appear in court," Sood says. Last year, when the government proposed to introduce 27% reservation for other backward classes (OBCs) in Central educational institutions, doctors across the country from medical colleges and hospitals such as the All India Institute of Medical Sciences took to the streets in protest. One doctor, M.M. Mittal, appeared before a five-judge bench, including the Chief Justice of India, in October 2007 to challenge the Centre’s proposal and argued on complex principles in Constitutional Law without any legal assistance. Mittal says he filed his application in the OBC case after a friend, who is a lawyer, told him to argue his own case. “I was passionate about the issue and took it up as a challenge. I frequently visited the Supreme Court library and the Parliament annexe library. I read up on the constituent assembly debates. I have the Indra Sawhney (Mandal I) judgement on my fingertips," he points out. “My arguments have been mentioned in the final judgement," he claims. Mittal’s fight, however, didn’t end once the court’s verdict on OBC reservations was pronounced in April. A month later, he was back before the Chief Justice alleging that the Union government had failed to implement the court’s directions. This time, however, his plea was dismissed. Besides PILs, petitioners-in-person argue personal cases as well. On 19 November, a Delhi schoolteacher, Sumedha Nagpal, won a decade-long battle for the custody of her son after arguing her own case. A former judge of the Supreme Court, justice Santosh Hegde says that during his tenure as judge, he encountered many petitioners-in-person who had prepared their cases well and argued articulately though they were not law graduates. “But they were an exception to the rule." He feels that the question whether the trend of petitioners-in-person filing cases should be encouraged is a tough one to answer. “This power could be misused. When there is an element of publicity, it defeats the purpose of PILs. Also, if a case is dismissed on an issue, then it sets a precedent and affects genuine cases on the same issue," Hegde says. Supreme Court lawyer Gopal Sankaranarayan says that lawyers themselves file PILs and argue their own cases such as M.C. Mehta, whose cases successfully brought reforms in governance. For instance, Mehta’s case led to the Delhi government’s switch to CNG (compressed natural gas) for its public transport vehicles. He feels, however, that while 50% of such cases are genuine, many lawyers file cases as petitioners-in-person for publicity. “Ridiculous cases like the one of (actors) Richard Gere kissing Shilpa Shetty was argued by an advocate as petitioner-in-person," he recalls. About the judges’ attitude towards petitioners-in-person, Supreme Court lawyer Devvrat, who uses only one name says, “The attitude of the judges is sometimes casual. The courts should be more sympathetic." In cases of public interest, how, ever, he says the court does give more weight due to the “public-spirited nature of the petitioners-in-person". Sankaranarayan says, “Majority of the judges are patient as long as the petitioner argues with basic courtesy and is not wasting the time of the court." Perhaps the most celebrated petitioner-in-person with frequent appearances in the Supreme Court this year is Janata Party president Subramanian Swamy, who argued his own case challenging the Centre’s Sethusamudram ship canal project that involved the dredging of the controversial Ram Sethu. “I always argue my own cases. Before I went to the Madras high court, five others had their petitions dismissed and the stage was set for the breaking of the Ram Sethu. A senior counsel of the Supreme Court was supposed to argue the Ram Sethu case, but they are saddled with so many cases," says Swamy. He recalls arguing his first case as a petitioner-in-person in 1982 when the former mayor of Bombay (now Mumbai) filed a defamation suit against him. Some lawyers who have seen Swamy, a professor at Harvard University, in action often assume he has had legal training. Says Swamy, who did serve as a law minister in the Chandra Shekhar government in 1991: “I have no legal background. But I have filed almost 15 cases, out of which 10 are PILs. My wife is a lawyer and that was also an advantage." Currently, Swamy is busy preparing to argue a case challenging the release of LTTE militant Nalini, convicted for her involvement in former PM Rajiv Gandhi assassination. 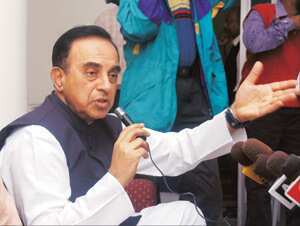 Says Swamy: “I argue my cases in a non-emotional way."